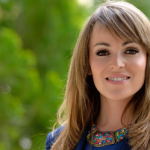 Rebeca Pérez is the youngest councilmember currently holding office in Murcia, she grew up in “el Esparragal” a town belonging to Murcia Municipality. And although she has worked in the private sector for many years, she has always had a special connection to her town and politics through her father, ex-president of the local town council, and through her efforts while belonging to youth-associations, organising, debating and committing in a hands-on approach to improve her town and its activities. As a councilwoman of Murcia City Hall she holds the portfolios of Youth and Development Cooperation, as well as being the official spokesperson for the Municipal Government.